Apparently if your servers and clients (which all have NTP) have their time changed can affect various processes. 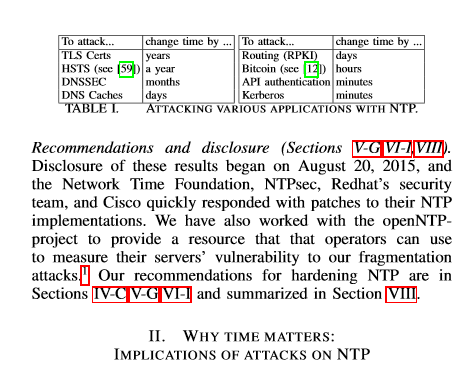 There are apparently some attacks on the NTP infrastructure that have a good chance of success and if succeeding would potentially be able to stop encrypted communications (by changing the date of year). So a successful attack could cause encryption to stop on shopping carts, or at least a potential customer would see that the site is not secure and take their business elsewhere. A potential attack can create problems with a reboot – as that is when time can change the most (as there is a threshold of change most ntp processes will allow without failure). Especially if a -g option is used with the ntpd daemon on Unix/Linux systems. Off-Path attacks are hard due to the attacker inability to observe the client-server communication. Due to the origin timestamp as the nonce (a cryptographic string only used once). This research shows that although initially the time stamp nonce is a good cryptographic method to protect communications Section B shows differently. 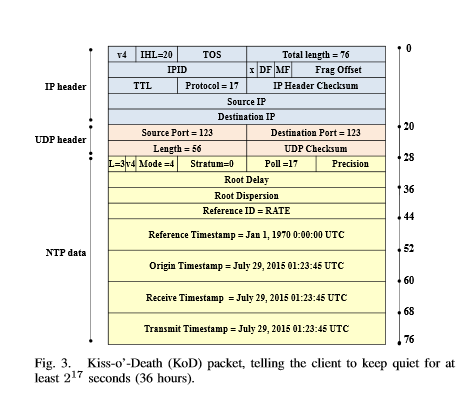 B. Exploiting the Kiss-O’-Death(KoD) packet. A server sends a client a KoD packet when it is queried too many times. kod = 17 (the maximum allowable polling interval ) then the ntpd v4.2.8 client will stop querying the server for at least 2 kod sec (36 hours). The Attack by the researchers uses KoD as a low-rate off-path DOS attack, the attacker can learn IP addresses of all preconfigure servers from which the client is willing to take time, and periodically(once every 2^7 KoD seconds) spoofs KoD packets from each of hem. The client will not synchronize to any of its preconfigured servers, and NTP is deactivated. Unfortunately this attack can continue indefinitely. Knowing the Attack, now we need to find which systems are susceptible to this attack(the attack surface). TableII shows the ntpd versions on the Internet. As per http://www.ntp.org/downloads.html the current version of ntp – 4.2.8p4. Out of the 13M servers we scanned, about 24K servers were willing to fragment to a 68-byte MTU. 10K of these servers have bigger problems than just being vulnerable to our attacks: they were either unsynchronized or bad timekeepers. Who are these vulnerable servers? The majority 87% (10,292) are at stratum 3, 14 at stratum 1 and 660 at stratum2. Here is a good explanation of the different stratum servers. http://www.endruntechnologies.com/stratum1.htm essentially stratum 1 means being connected to the main stratum zero servers. Apparently Cisco and RedHat have issued patches because of this research. When DOS attacks are used on mail servers it can cause indirect attacks to succeed. http://oversitesentry.com/contact-us/ to discuss your specialized situation.